Former Managing Director with Pinkerton Consulting and Investigations. He is a member and Past President of the American Society for Industrial Security International and has also served as the Chairman of the Board ASIS in 1982. 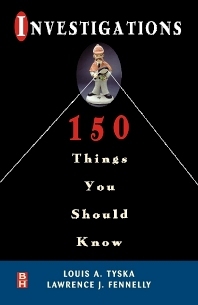 He has co-authored several books including Controlling Cargo Theft, Security in the Year 2000, Office and Office Building Security, 150 Things You Should Know About Security, and Investigations - 150 Things You Should Know.